A Chinese mining project imposed ten years ago in the name of development forced 10,000 Tibetan nomads off their traditional grazing lands around the Yulung Zangter Mountain, which carries religious value for the nomads. Even with small compensation and resettlements, many of the nomad communities are still suffering greatly from this project. Despite continuous appeals to the Chinese government, the mining project is expanding to more and more nomad communities causing environmental destruction, pollution, illness and the loss of livestock. Similar projects are executed in other parts of Tibet with little regard for the fate of its inhabitants. Tibetan nomads who have resided in their own homes for centuries around the Yulung Zangter Mountain in Kham Lhathog County of eastern Tibet, are now suffering after being forced to abandon their traditional grazing lands, with minimal compensation, in the name of development by the Chinese Government. "There is a population of approximately 10,000 Tibetan nomads in the county who have been relocated by the Chinese government, with nearly 400-500 homes around the Lhathog Yulung Zangter Mountain affected by the Chinese mining operations," sources told TPI, speaking anonymously. The Yulung Zangter Mountain in Kham Lhathog County of eastern Tibet, is rich in copper, gold, silver, aluminum, lead and iron. The mining project in Lhathog County is known as the largest in china and the second largest in the world, sources told the TPI, adding: There is an excessive amount of resettlement happening in places riddled with alcohol, gambling, increasing Chinese migrants and prostitution, all of which are becoming major problems making the county a morally void place, particularly for younger generations. Nomads have appealed to the Chinese government for several years to stop the ongoing mining operations around the holy mountain that are causing devastating environmental destruction and pollution leading to water contamination, illness of locals and the loss of animals. However, their appeals have remained unsuccessful. 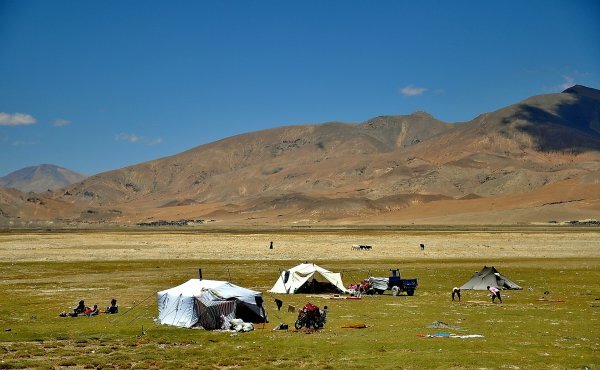 Tibetan nomads who used to live near the front of the Yulung Zangter Mountain in Lhathog County of eastern Tibet are facing tremendous suffering after being forced to abandon their traditional grazing lands over 10 years ago. "Every year, each household earns about 50,000 Yuan, which was enough before the mining operations. But they have been forcibly relocated with insufficient compensation, sub-par housing, and a lack of government assistance in finding jobs," sources stated, adding that "the nomads are illiterate and have no experiences in industrial work, even so there is a huge lack of jobs in the resettlement towns." Sources told the TPI that another Tibetan nomadic community located behind of the Yulung Zinger Mountain are now being forced to abandon their traditional grazing lands where mining operations started at the beginning of 2017. The government has already taken land from Tibetan nomads with minimal compensation and they are now being forced to abandon their traditional grazing lands and the caterpillar fungus business as the mining area has been fenced off and become a restricted area. "Several other mining operations were carried out by the Chinese government at other mountains, including a holy mountain called "Dolma Punsum" which is highly respected by the nomads in Lhathog County," sources said, adding: "the priceless treasures exploited from these mountains in Tibet have already been taken to China." This deteriorating situation is not uncommon. Massive land-grabs by Chinese government have been going on for decades in different parts of Tibet, particularly in the east, northeastern and central parts of Tibet (Ch: Sichuan, Qinghai and the Tibetan Autonomous Region).